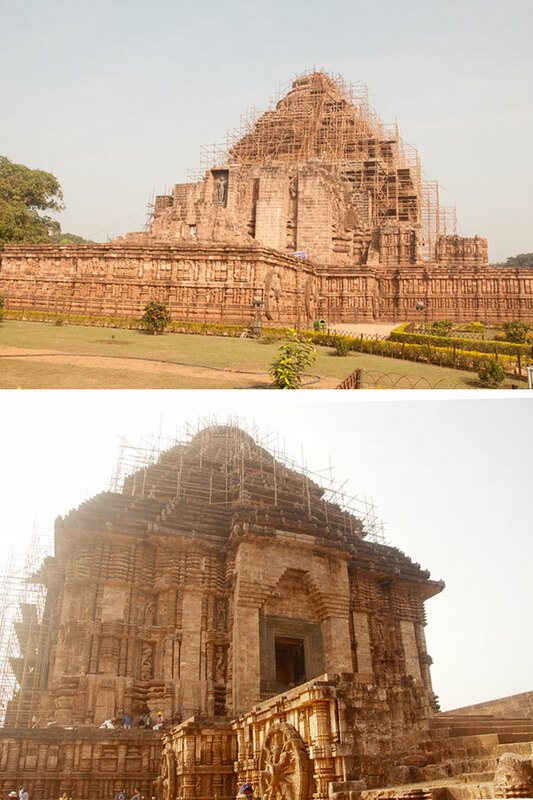 In course of time Konark temple lost its glory. It is very difficult to conclude the causes of its decay and fall of its magnificent monument. According to scholars their opinions differ on their individual research. Some of the possible causes of the fall of this magnificent temple are listed below. Historians says that due to the early death of the king Langula Narasimha Dev who is the builder of temple left the temple in haphazard state which led the incomplete construction eventually collapsed. But this argument has no supporting history as a result it is not tenable. Fables narrate that the loadstone that was on top of the temple was the reason of the fall of temple. As the loadstone having the magnetic effect, it attracted the passing by vessels and other stuffs that circulated through Konark sea resulted in causing heavy damage to the temple. Some legends also state that the loadstone with it magnetic effects disturbed the sailing ship’s compass as the result Portuguese voyagers took away the loadstone. As this heavy stone was the central stone holding all the stones and iron columns together keeping the temple walls in balance. Due to its displacement the structure lost the balance and eventually fell down. But there is no record of this occurrence too. As the other famous theory says (Kalapahada) Sultan Sulaiman Karrani destroyed the temple along with other Hindu temples when he invaded Orissa during 1508. Kalapahada was the title given to Muslim governor of Bengal. In 1568 as Muslims started ruling Orissa they destroyed most of the Hindu temples. Scholars also argue that the fall of Konark temple might be due to earthquake and thunderstruck. But even this point has no supporting fact, since there is no record of earthquakes in the place. As there is no destruction in any area of the temple’s foundation and since the thickness of the temple walls are 20 to 25 feet thus the argument gets no value, while it is not possible for any earthquake or thunderstruck to disturb the temple in any manner. Konark Sun temple is protected under the National Framework of India by the Ancient Monuments and Archaeological Sites and Remains Act (AMASR) and its Rulers (1959). Under this AMASR Act, 100 meters outside the property and the further zone of 200 meters outer property constitute prohibited and regulated zone for the development of the outstanding monument. Archaeological Survey of India has undertaken all the conservation programmes through its national, regional and local representatives. The other relevant protective law includes the Forest Act, Konark Development Act and notified Council Area Act. The temple is in the shape of a gigantic chariot.